What’s a Live Event that’s LIBerating? Well it’s Lightning in a Bottle of course and I had a chance to sit down with one of the founding producers to learn more about an event I had yet to year about let alone experience. Dream Rockwell (yes, that’s her name) bounced my way with her beautiful blonde curls and sat down with charm and grace excited to tell me the details of how the event began. 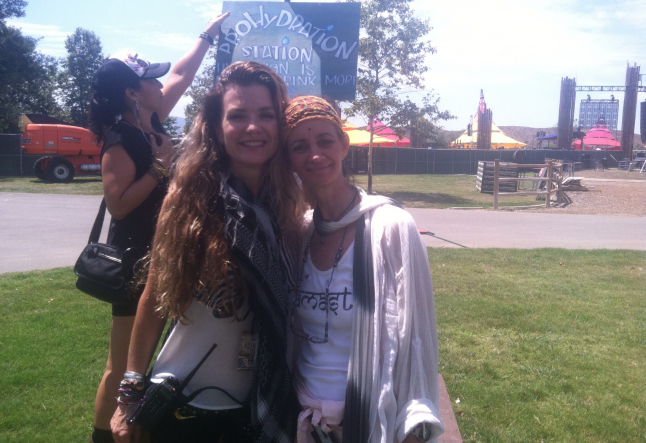 Dream explained the reason for the original celebration was to gather for yoga & music for her & the other founders’ 800 closest friends at Jakes Ranch on the Mayan Day at a Time back in 2004; a birthday party in part with a celebration for Life! Her part in LIB? Being the Temple of Consciousness when her adventure into yoga started 17 years ago at the Omega Institute with a drumming class. Believe me when I say, I have never experienced anything quite like this on such a magnitude. Catapulting electronic music, diverse art and self-expression by participants with the attitude that pretty much “anything goes.” The message is made clear, “no one can tell you how to experience LIB” but the hope is you can create a self experience by seeing the brighter, more exciting, creative way than thought possible all through shared experiences. The food? Delicious raw, vegan with The Bliss Cafe being my favorite, famous for their smoothies along with the Om Shanti Tea Tent to cap off your lunch or dinner. With all the diverse activities & performances, it was entirely impossible to take it all in. The Temple Stage, Lucent Mystery School, Pineal Playground and the Bamboo stage to name a few plus a Kids Zone. Did I mention free water...everywhere on a hot California desert reservoir at Lake Skinner in Temecula, California. Hosted by the Do LaB with the green mission of “Leave it Better, Leave it Beautiful.” Accomplished.